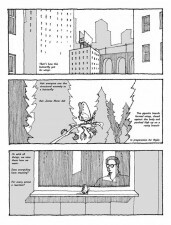 Originally self-published as a six-part series, Owen D. Pomery’s Between the Billboards tells the story of James Ebner who voluntarily removes himself from society to live a solitary existence ensconced in a converted water tank between two billboards on the top of a building. Micropublishers Avery Hill – who also publish Pomery’s The Megatherium Club – clearly thought so too, as they recently collected the entire story alongside other work from the artist in the handsomely bound Between the Billboards & The Authoring of Architecture. Given that one of my review quotes sits on the back of this book today’s ‘Small Pressganged’ is perhaps a little recycled in nature as I’m revisiting some of my thoughts on Between the Billboards alongside brief additional commentary. I always feel, though, that if you’re going to plagiarise then it’s essential you do so from a respected source that you trust implicitly. 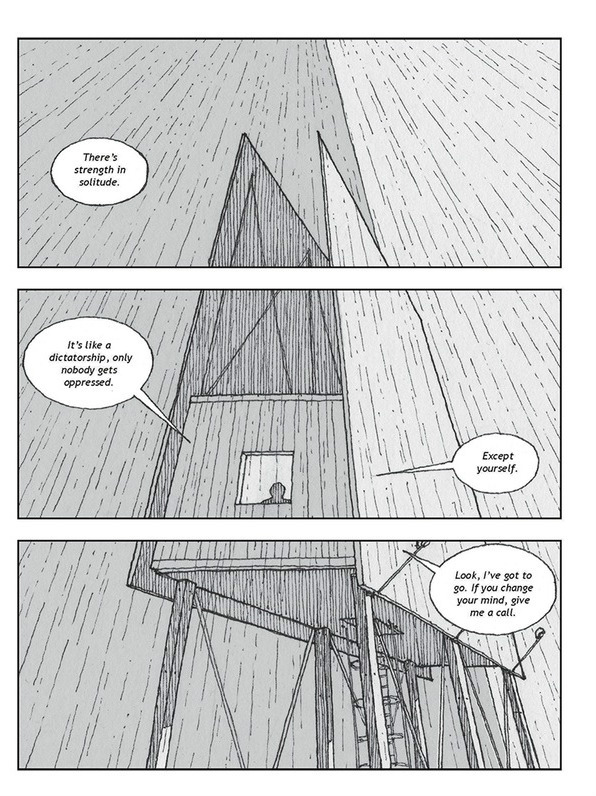 Between the Billboards follows the isolated lifestyle of one James Ebner, a peculiarly reclusive individual who has chosen to live a hermit-like existence inhabiting a converted water tank between those two titular billboards atop a building. Over the first instalments of this story we observe Ebner’s increasing seclusion from society as he withdraws further from the world below, his interactions with it becoming progressively stilted and intermittent. Piece by piece he gradually slips away from society, becoming cossetted in his high-rise hideaway as a result. Replete with metaphor, Between the Billboards adopts a reflective and starkly philosophical commentary on its protagonist’s gradual slide into self-imposed obscurity; one that echoes Abner’s own growing flirtation with nihilism (although perhaps “seduction by” would be a better term). 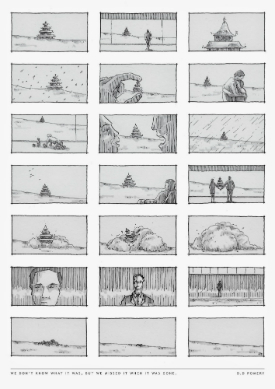 One of my favourites soundbites from the book is this: “There’s a strength in solitude. It’s like a dictatorship, only nobody gets oppressed. 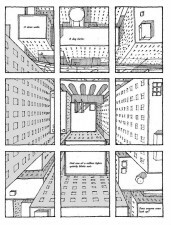 Except yourself” because it so perfectly encapsulates the mood of Between the Billboards; an overwhelming sense of self-repression as Ebner’s subsistence in his rooftop hermitage slowly deteriorates. 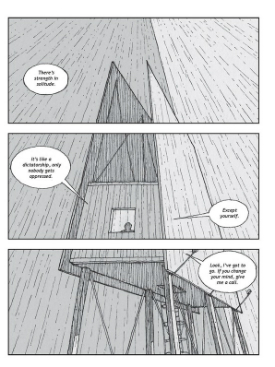 From the composition of his visuals it’s readily apparent that Pomery is one of those creators who fully appreciate the unique storytelling opportunities inherent in the comics page. 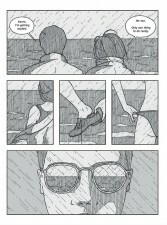 Rarely have I seen the 9-panel grid used to such skilful effect for example. 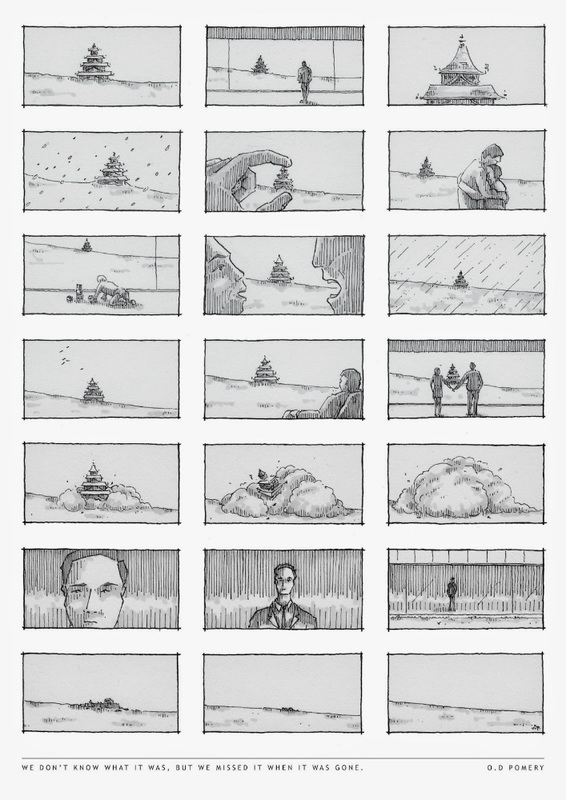 One particular page using one of those eponymous billboards to mark the passage of time is breathtaking in its elegance and deceptive simplicity; an excellent example of the particular storytelling tricks that can only be pulled off in this medium. 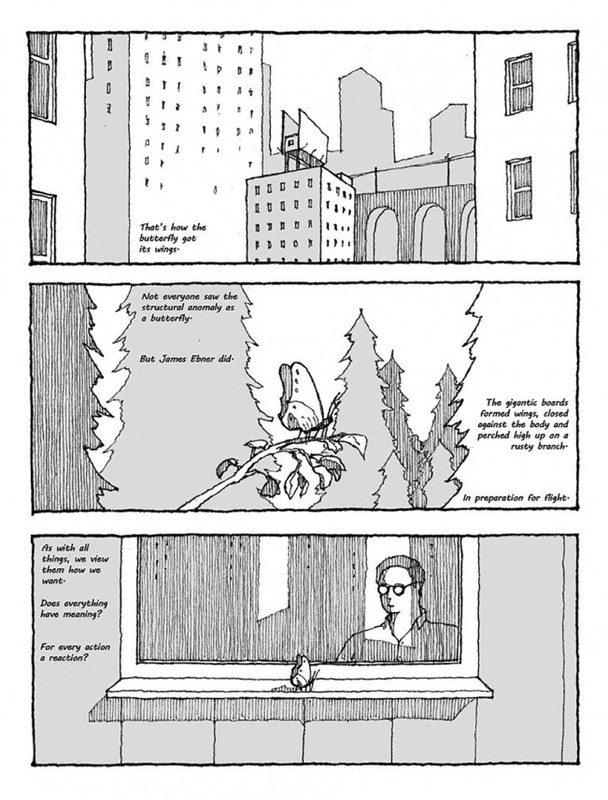 There’s something more than vaguely reminiscent of Eisner in the way Pomery portrays the cityscape as almost a character in its own right here. As the narrative progresses towards its denouement Ebner’s last true link to the world he has sequestered himself from has been severed, leading into the title’s probably inescapable conclusion. The culmination of six chapters of ominous foreshadowing and minimalist build-up, it may be an ending you foresaw but its impact is nonetheless undiminished by its inevitability. 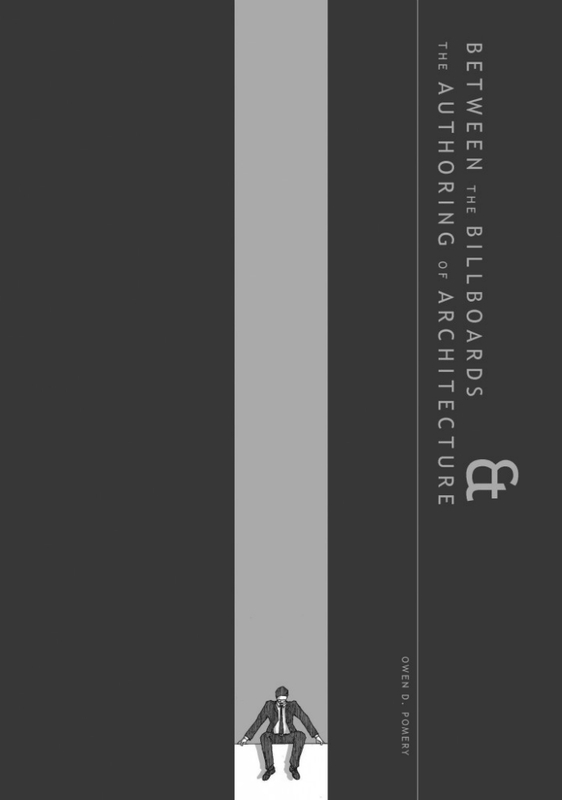 Perhaps the strangest reaction to Between the Billboards as we reach its finale is that, despite the title’s relatively small page count, there’s a sense that the reader has accompanied Ebner on a long journey. In this regard it’s quite remarkable how much concluding events affect us emotionally given that Ebner is a largely unsympathetic character; an enigmatic cipher whose very nature renders him impossible to empathise with. Pomery’s prose – in whatever genre he turns his hand to – is always precisely constructed and it’s that same careful consideration of language that is such a major player in this book’s success. But that delicate craftsmanship is not limited to the written word. 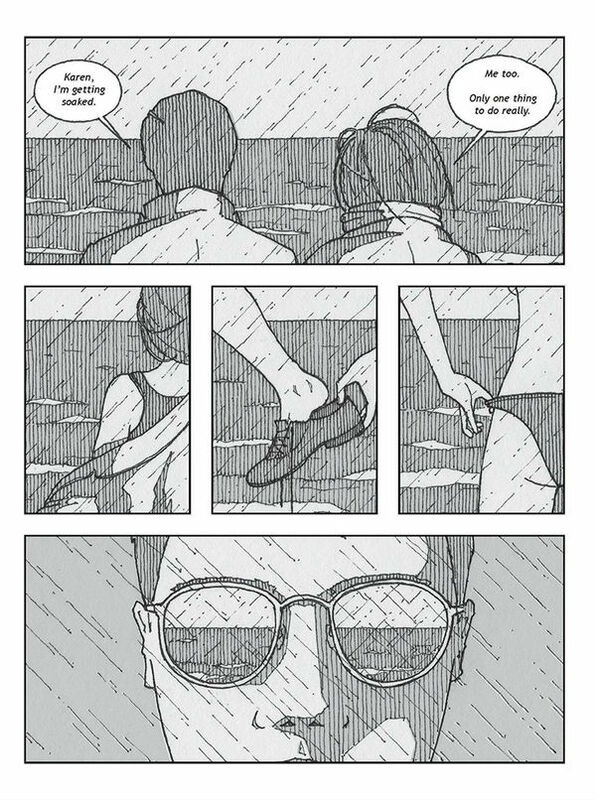 On the visual front his panel construction is meticulously structured to advance the needs of the narrative and his use of perspective in the final chapter is just exquisite in presentation. Returning to Between the Billboards some years after I originally started reading it was an intriguing experience. On my original consumption of the book I always felt that its intermittent publishing schedule as a serial comic in such small, bite-sized, sometimes slightly oblique instalments actually added to the reading experience – mirroring in presentation the fractured psyche of its protagonist – and wondered whether something vital would be lost when reading it as a compilation. Fortunately, those slightly disjointed insights into Ebner’s world retain their splintered reality here, adding to the sensation of detachment that is such a part of the main character arc. 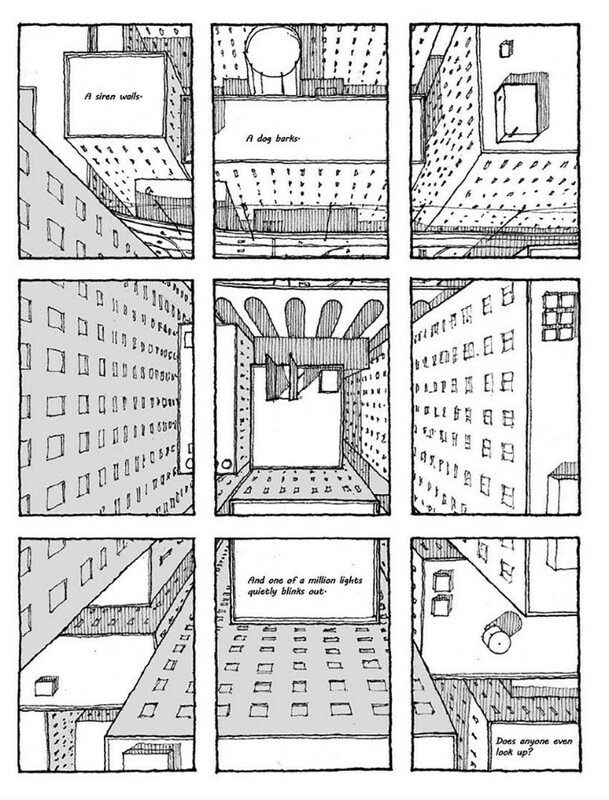 Backing up the main feature are a number of additional related short form comics with commentary (including ‘We Don’t know What It Was, But We Missed It When It Was Gone’ right), and a fascinating essay from Pomery on his architectural background, the way in which that discipline has translated to his comics work, and how environment influences the individual and vice versa. It’s a perceptive analysis of the relationship between the two and the breadth of extra material here ensures that Avery Hill’s collection is an essential supplementary purchase for those who picked up this urban parable on the dangers of disconnecting and the necessity of human interaction the first time around. 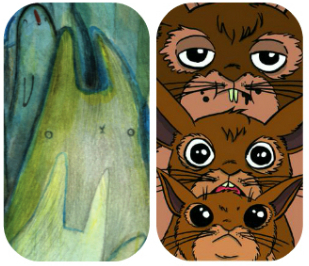 For more on Owen D. Pomery’s work check out his site here and follow him on Twitter here. 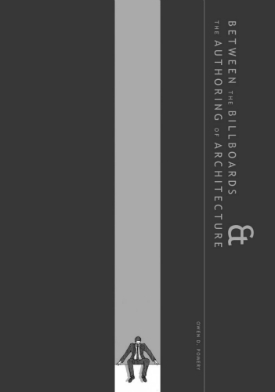 You can buy copies of Between the Billboards & The Authoring of Architecture from the Avery Hill Publishing online shop here priced £11.99. 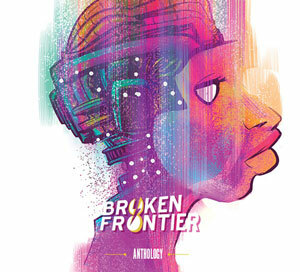 Readers in the US can pick it up via the Retrofit Comics store here.